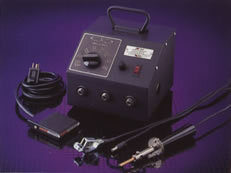 Description: System Description: This System consists of a Model 105A3 (100 watt) Power Unit, a Model 10515 Single Electrode Handpiece, a Model 10512A Current Return Lead with Alligator clip and a Model 10519 Footswitch. Handpiece Description: The Model 10515 Single Carbon Electrode Handpiece is supplied with a 3/32 x 3” (2.38 x 76.2mm) copper-clad carbon Electrode. This Handpiece features a lightweight plastic handle with a cork insulator for operator comfort and is assembled with thin aluminum heat baffles for cooling and nickel-plated brass electrode adapter for fast efficient heating. It is equipped with a four-foot (1.22m) 10 AWG high stranded DLO cable (for flexibility) with a taper pin quick connect terminal for connection to American Beauty® Power Units (push in turning clockwise until snug). The Model 10512A Current Return Lead is supplied with a small alligator clip and a four-foot (1.22m) 14 AWG Neoprene cable (for flexibility) with a taper pin quick connect terminal for connection to American Beauty® Power Units (push in turning clockwise until snug). For more detailed information please read the Information/Instruction sheet included with the Handpiece in this Kit. Description: System Description: This System consists of a Model 105B2 (1100 watt) Power Unit, a Model 10511 Single Carbon Electrode Handpiece a Model 10512 Current Return Lead with standard electrical clamp and a Model 10519 Footswitch. 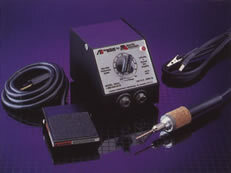 Uses: This System can be used to create accurate, trustworthy solder joints in many applications which include but are not limited to copper tubing, semi-rigid coaxial cable, microwave connectors, motor stators, electrical motor rebuilding applications and general service in electrical equipment manufacture, rework or repair. Handpiece Description: The Model 10511 is a Standard Single Carbon Electrode Handpiece. It is supplied with a 1/4" x 3” (6.35 mm x 76.2 mm) Copper-Clad Carbon Electrode. This Handpiece features a heavy-duty Bakelite handle for operator comfort and is assembled with Nickel-plated steel heat baffles for cooling and Nickel-plated steel electrode holders for fast efficient heat. It is equipped with a four-foot (1.22 m) 10 AWG high-stranded DLO cable (for flexibility) with a taper pin quick connect terminal for connection to American Beauty® Power Units (push in turning clockwise until snug). The Handpiece weighs only 6 ounces complete, which minimizes operator fatigue. Electrodes may be inserted straight into the Handpiece or at a 45-degree angle, depending on your application requirements. The Model 10512 Current Return Lead is supplied with a standard electrical clamp and a four-foot (1.22m) 10 AWG high stranded DLO cable (for flexibility) with a taper pin quick connect terminal for connection to American Beauty® Power Units (push in turning clockwise until snug). For more detailed information please read the Information/Instruction sheet included with the Handpiece in this Kit. Footswitch Description: The Model 10519 Footswitch is a rugged, industrial switch, (wired normally open), with a six-foot (1.83 m) 18-3 SJT cord and NEMA 5-15 P/R piggyback style plug/receptacle. This footswitch is often used to better control the cycle time needed for an application.